Where does work finish and fun begin? 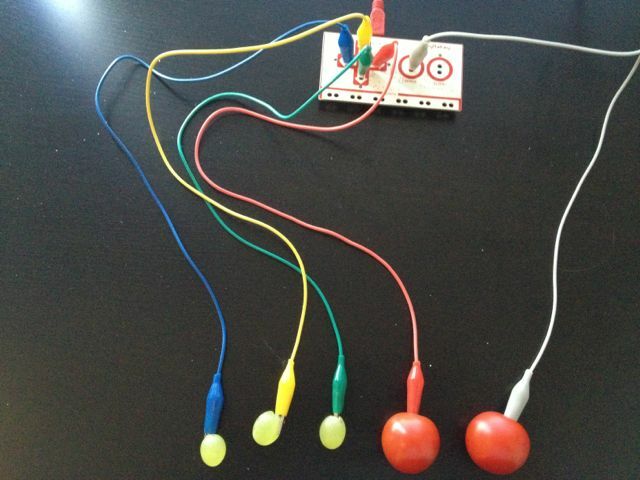 I’ve been playing with a Makey Makey kit that turns everyday objects into touchpads. As mentioned in an earlier blog my aim is to encourage elderly folk to see what they can make using it and to see if they can then teach kids how to create using it – inspiring a younger generation to unleash their ideas. Part of the fun with using this kind of electronic toolkit, with fruit and salad as the input, is discovering something new about the world. In this instance, it got me thinking about how conductive different materials are – since this makes a difference to how well they act as input devices. I started off testing out plastic salad serving spoons but that was a clear no-no, whereas when I tried with the grapes I discovered they were very conductive. Apples were somewhere in between. It also led me to look into the fridge to see what else I could experiment with – cucumber, mustard, falafels, cheese, bread, chocolate… so many possibilities. Not only does Makey Makey make you think creatively it also helps you begin to understand some of the principles behind basic electronics. I’ve been looking recently at how others have been embedding technology into everyday objects. One of the latest trends is fashion. While, wearable computing has been around for several years, new and affordable electronic materials, such as LEDs, thermoconductive paints, longer life batteries and so on, are providing a richer palette for fashion designers to work with. One start-up ‘fashion and technology’ company called Studio XO, are leading the way. They have been creating and engineering interactive clothing that is stunning to look at and marvelous to wonder about the techno-gubbins behind it. Last month when I was in London, I went to a talk given by the co-founders, Nancy Tilbury and Ben Males, in the very fashionable Soho House club. It was packed to the rafters with fashionista and technology hipsters from all over London – standing room only. Nancy and Ben were interviewed in a Q&A format by some cool dude who worked for crane.tv (an online video magazine for contemporary culture). After showing a short video they had made, they talked about their ideas and demonstrated their digital mermaid bra designed especially for Azealia Banks Fantasea Tour. It was studded with hundreds of blue and clear crystals interwoven with LEDs, which diffracted light among the crystals, animating them in time to music that was controlled by a pre-programmed circuit. Quite stunning. 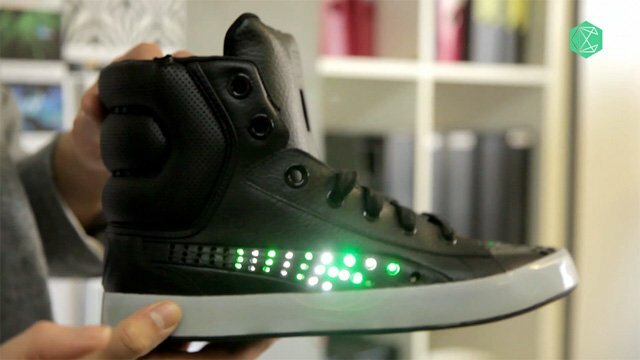 They also showed a Sneaker shoe they had embedded with various electronics, including a small LCD on the tongue that displayed an animated Puma running across it and various other LEDs in the sole and heal that lit up, depending on what the shoe sensed and did. Many of their designs are one-offs customized for rock bands and popstars. What they are now trying to do now is work out how to move on from one-off commissions to the mainstream clothing market. At the end of their interview with crane.tv the audience, strangely, were baying for their blood. “How is it fashion? How is it different from Christmas tree lights?” one member asked? Another wanted to know why they were not creating more down-to-earth, health-related clothing that could improve the lives of millions of people, such as vests that could fend off mosquitos, thereby reducing malaria in Africa. Another wanted a suit that would grow with his expanding waistline and change to match his clothing needs rather than twinkle to reflect his emotions and moods. Others wanted more sustainable and durable clothing. Still others could not see how this kind of fashion technology could become mainstream, H&M clothing. Who would pay the extra for gear, that displayed digital content, other than a few trendy night clubbers? Nancy and Ben, I thought, had a really tough time under the London fashion spotlights but defended their patch and position very well. I also thought their creations were highly original, pushing the envelope of fashion and technology in innovative ways, and, importantly, were a real pleasure to look at. Aesthetics still plays a vital role. Having digital content appear in various forms on your clothing in ways that the wearer can upload and control offers much potential for individual creativity and personal style. Maybe I am naïve, but I can see their push into mainstream fashion taking off … if only others could be less cynical. I’ve also recently been exploring how technology can play a role in enhancing the dining experience. Similar arguments surface. We ran a workshop at the end of last year at the John Salt restaurant – that Ben Spalding was the resident chef at the time, experimenting with his creative and quirky pop-up dining experience. The questions raised at our workshop were many, but included does augmenting food with digital technology, such as lights, sounds and other media enhance the eating experience or does it serve simply to titillate? Moreover, might it distract and even get in the way of the enjoyment of eating? What does new technology, in its various guises, add that other ways of contextualizing the eating experience (choosing the seating, the cutlery, the lighting, the colour, the music, etc…) can’t already do. Is it just another gimmick? Or are we onto something quite new? it seems there is a fine line between fad and fun when it comes to fashion and food. But there is much to be gained working out how best to mix technology with everyday materials to make the combination valuable, pleasurable and worthwhile.